Fitness columnist David Last takes us through some of his favourites. IRELAND HAS BEEN experiencing one of the best heatwaves in recent memory and we should be taking advantage of it as much as we can. Changing up your venue and bringing your routine outside, while getting a nice dose of Vitamin D, can only lead to good things. I’ve always been a huge fan of bringing my training outdoors and there’s no reason why you can’t too. From trail runs, cool hikes, bike rides to dips in the Wicklow lakes, I have pretty much tried it all. We spend enough time indoors in the gym so why not change up your routine a little and use the fitness that you have worked on by doing some activities outside? The key is to keep it varied, fun and effective. You will be surprised at what is out there and what you can do. The options are endless. I took this on with a group of friends and we had a blast. We got fantastic weather which was a huge bonus and it was a super day out and something I would really recommend. Dotted in County Mayo, escape the bustle of urban life on the 42km Great Western Greenway, the longest off-road walking and cycling trail in Ireland. The world-class Great Western Greenway is a traffic-free cycling and walking trail which follows the route of the renowned Westport to Achill railway which closed in 1937. 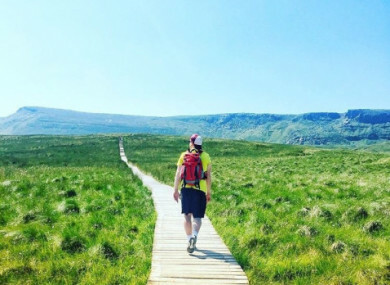 Hiking the stunning Cuilcagh Legnabrocky Train in Fermanagh should definitely be on your summer bucket list. This is a fantastic scenic trail that is part of the marble arch caves with a wooden boardwalk stretch all the way to the top which leads to a spectacular view which has been aptly named the Stairway to Heaven because if you can make it to the top, the views will take your breath away. The trail stretches over 7.5km and is considered a moderate hike. If you are looking for a bit of an adrenaline kick then this is a fantastic way to change it up and have some fun while taking in some pretty amazing sites looking over Dublin. I headed up to the foothills of the Dublin mountains and found myself at Ticknock, which is a popular destination for a lot of people at the weekends. I rented a bike from the biking company Biking.ie and must say it was a super three hours. They also have another fantastic route in Ballinastoe, County Wicklow. I was quite hesitant about trying it at first as I thought these trails were for the pros. But to be honest, it caters for everyone and the guys at Biking.ie looked after me really well. The area you ride in has purpose-built, single-track trails and forest roads that are designated for use by mountain bikes on a marked circular route of 8km in length. The trails take the rider through beautiful forest with fantastic views over Dublin city and the Wicklow mountains beyond. This summer I started a little bit more swimming and it has been a nice change to my fitness plan. Doing the same thing over and over again will eventually get boring and can only lead to burnout, fatigue or loss of interest. That was the most common thing I would see when working on the gym floor. People would join their local gym in January and come the summer they have drifted away as doing the same thing over and over eventually became a chore. Below you can see some of my swimming spots. My favourite places these days are Lough Tay which is hidden in the Wicklow mountains or the famous and busy Seapoint in Dublin. Both are great places you should check out. From where I am based in Dublin, there are so many locations to consider when deciding to go for a trail run. Places like Glendalough, Ticknock, Massey’s Wood and Knocksink Wood offer some great trails. Here is a snip of me on the sleepers in Cruagh Wood which is an amazing trail with spectacular views over Dublin. I also find that Parkrun is a great way to start your weekend. Parkrun is a series of timed 5km runs held on Saturday mornings across the world, with more than 50 locations now hosting the event nationwide. My favourite one is in my local Marlay Park and it’s always great to see so many people attend every Saturday morning. They are open to all, free, and are safe and easy to take part in. I hope that you found some of these ideas useful and you can find time to give one or two of them a try. If you know of any other great outdoor activities and locations your comments would be most appreciated below. Email “The great outdoors: Some of Ireland's best spots for a weekend hike, cycle or swim”. Feedback on “The great outdoors: Some of Ireland's best spots for a weekend hike, cycle or swim”.